It was a golden era. Horsepower was unlimited; designers, builders and drivers just needed to harness the horses of massive engines and deliver their thrust to the track. It was an age of 8-liter aluminum Chevys, turbocharged Oldsmobiles, flat-12 Porsches and the best and brightest designers from McLaren, BRM, Lola, March, Shadow, AAR, Caldwell, Kar Kraft and others who designed cars to suit them. 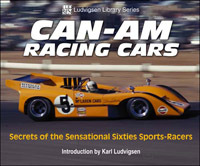 In this must-have book for fans of the Can-Am cars, Karl Ludvigsen reveals the machinery under the skin of these immortal racers as he photographed them in their heyday at Elkhart Lake, Bridgehampton, Texas and Riverside. Page after page of highly detailed black and white photographs are accompanied by his knowledgeable commentary on the cars and their technology.